I have already shown you in the past how to install and run SQL Server in Docker Containers, and how to deploy Availability Groups and stand-alone SQL Server Instances into Kubernetes Clusters. In today’s blog posting I want to continue this discussion and you will learn how to install and configure SQL Server on Linux. 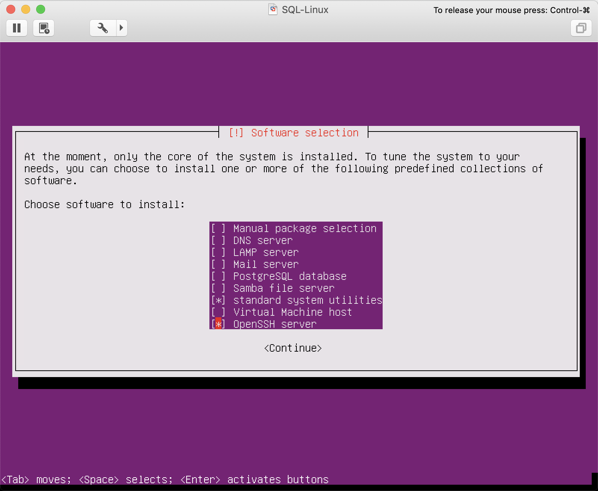 To show you how you can run SQL Server 2019 on Linux, I have chosen Ubuntu 16.04 for this blog posting. Because a lot of my readers are currently not yet familiar with Linux itself (who though a few years ago that we will be able to run SQL Server on Linux? 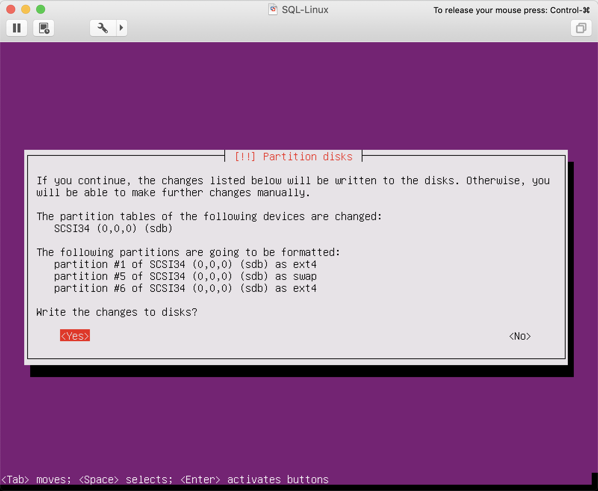 ), I also want to show you how to install and configure Ubuntu from scratch. In my case I will deploy SQL Server 2019 onto an Ubuntu Virtual Machine that I’m running in my serious powerful home lab. As you can see in the following picture, I have attached an additional hard disk which is attached to the high-performance VMware Paravirtual SCSI driver. We will store later on this dedicated hard disk all SQL Server Data and Transaction Log files. I don’t want to cover every single step of the Ubuntu installation, because it’s really straightforward. But I want to discuss a little bit about the Disk Partitions that are created during the installation. The following picture shows you the options that you have during the setup. 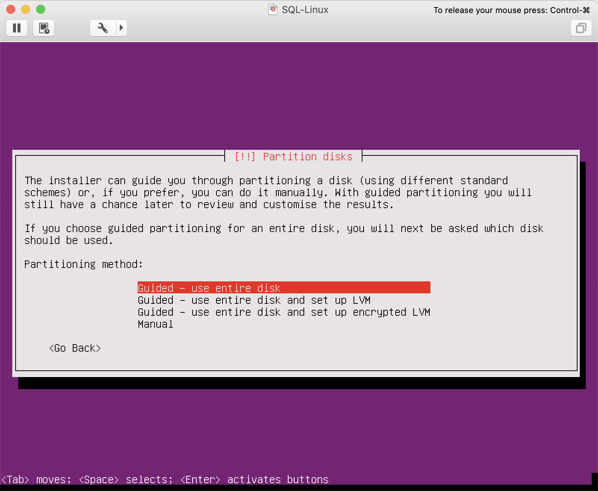 I have chosen here the first option, which partitions the whole disk. Because we have attached 2 individual hard disks to our Virtual Machine, you also have to select the correct disk in the next step. In my case, the smaller OS disk (16 GB) is /dev/sdb, and the larger 300 GB disk for the SQL Server Data and Transaction Log files is /dev/sda. 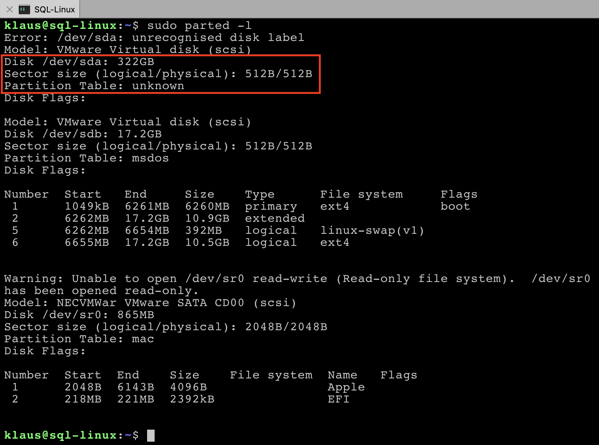 Therefore, I have only partitioned /dev/sdb during the installation. 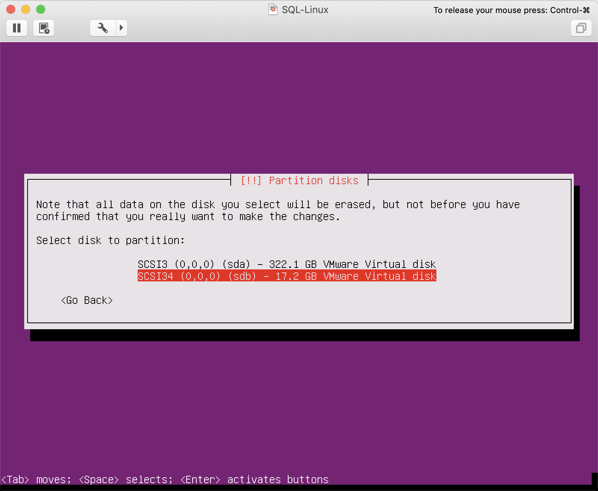 The other disk – /dev/sda – has no partition yet. We will partition that disk later prior the SQL Server installation itself. I have also installed the OpenSSH Server during the installation, so that I can access the Virtual Machine later through an SSH connection. 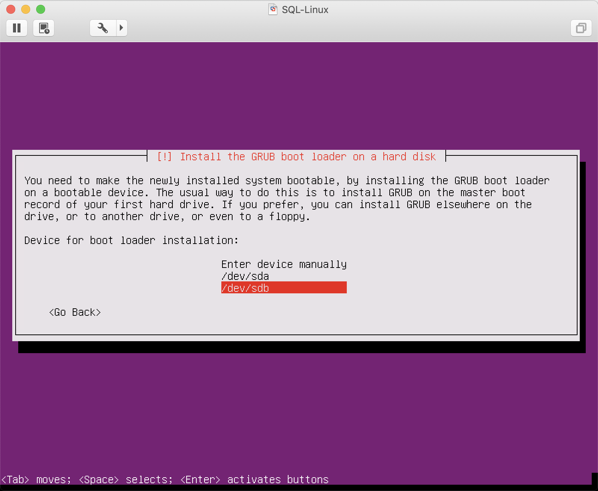 And finally, I have installed the GRUB Boot Loader on the /dev/sdb hard disk. If you have completed the Ubuntu installation (which only takes a few minutes), we have to configure in the next step our network connection. 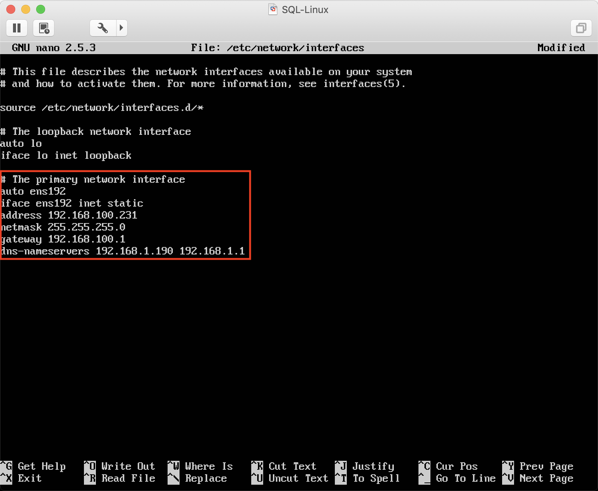 By default, your Ubuntu Virtual Machine will get its IP address from the DHCP server in your network. You can get this IP address from the ifconfig command. You can use it to connect through an SSH connection to the Virtual Machine itself. 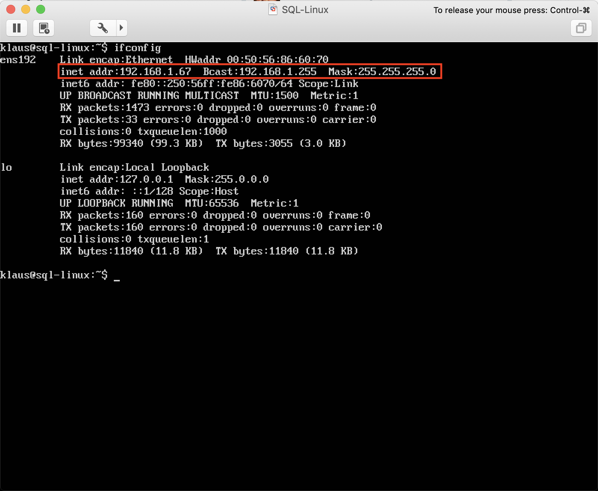 To make everything as reliable as possible, I always give a server machine a fixed IP address. To perform that task on Ubuntu, you have to change the file /etc/network/interfaces accordingly. 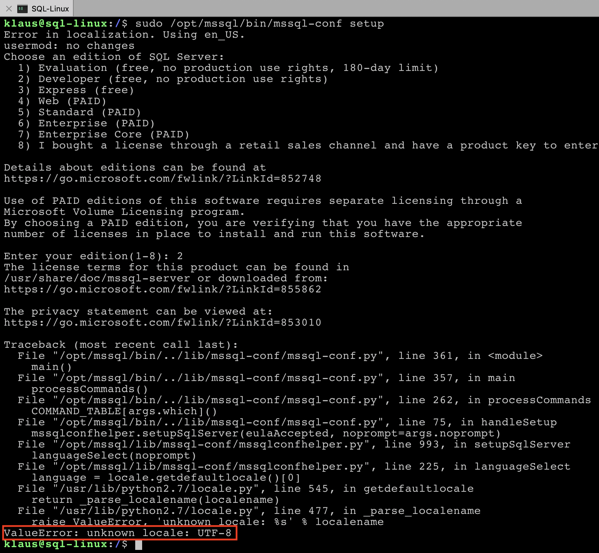 Currently it is configured for a DHCP server – as you can see in the next picture. 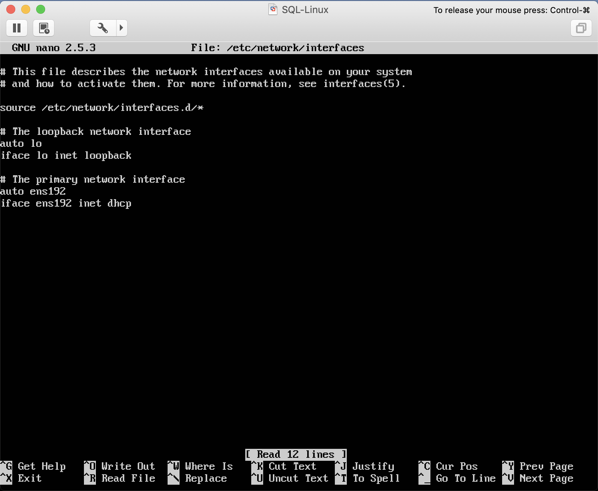 Afterwards I have performed a reboot to change the IP address through a sudo reboot command. Note: in a real-world scenario I would also recommend storing critical Transaction Log Files on their own dedicated disks for maximum performance. By now everything is configured correctly, so that we can install and configure SQL Server 2019 in the next step. As soon as you have installed SQL Server 2019, we also have to configure SQL Server through the provided configuration program /opt/mssql/bin/mssql-conf. You can think about that program like the SQL Server Configuration Manager on a Windows-based SQL Server installation. Let’s run now that program with the argument setup. 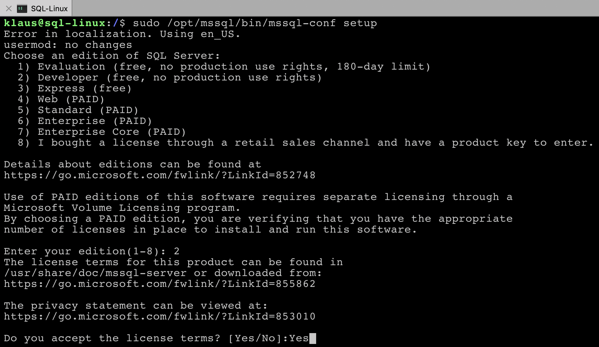 And finally, SQL Server is up and running – on Ubuntu! As I have mentioned previously, we want to store all our SQL Server Data and Transaction Log files under the mount path /sql, which is stored on a separate disk. Unfortunately, the setup program doesn’t give us the option to store the system databases in a different path. They are always stored by default at /var/opt/mssql/data. Note: The msdb files are reported by SQL Server with upper cases (MSDBdata.mdf, MSDBlog.ldf), but they are stored in the file system with lower cases (msdbdata.mdf, msdblog.ldf). Therefore, you also have to reference them during the mv command with lower cases, because otherwise the files are not found. 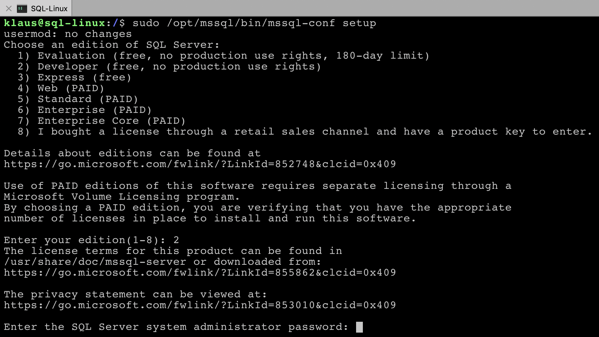 In this blog posting I have shown you how easy it is to install and configure SQL Server on Linux. 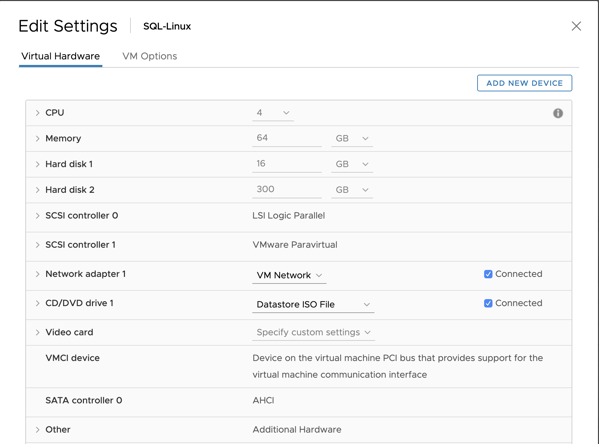 It’s a really straightforward process, and within a few minutes you have a fresh new SQL Server 2019 up and running – on Linux! 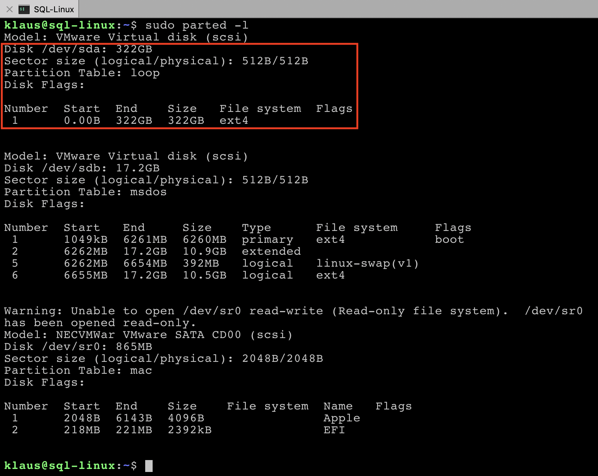 One of the drawbacks is that the system databases are initially stored in the folder /var/opt/mssql/data. Therefore, you have to make some changes afterwards to move them to a different location – maybe a different disk for better performance. For a production environment I would also recommend moving the TempDb files to a separate disk and create additional TempDb data file so that you don’t introduce Latch Contention problems in TempDb. If you want to learn more about SQL Server on Linux, Docker, and Kubernetes, I highly suggest my upcoming Live Online Training on May 13 and May 14, where I will do a more technical deep-dive about all these exiting new technologies that will change our life as SQL Server Developers and DBAs over the next years.